Why are drugs so expensive? Can drugs go out of manufacture? How can we lower the cost of healthcare and develop personal medicine for 7 Billion people? In this talk I will describe how we are going to digitize chemistry leading to a “Moore’s law of drug discovery and molecules discovered.” Unlike digital electronics and the internet, which rely on open standards and formats allowing universal implementation, chemistry is in the dark ages. This is because chemistry relies on expert users to design, carry out, and analyze chemical processes, making universal reproducibility impossible. Our goal is to develop the concept of ‘Chemputing’ which enables and exploits the universal digitization of chemistry. The key to achieving this goal is finding a practically implemented approach to the translation of a chemical synthesis into a universally executable set of instructions or chemical programs. The underlying software suite detaches the computer readable description of the chemistry from the control aspects of the hardware, enabling portability of synthesis. Our vision is to use a software language to be able to program the manufacture of any drug in a library as easily as running software on a computer or app on a phone. But will this be possible? 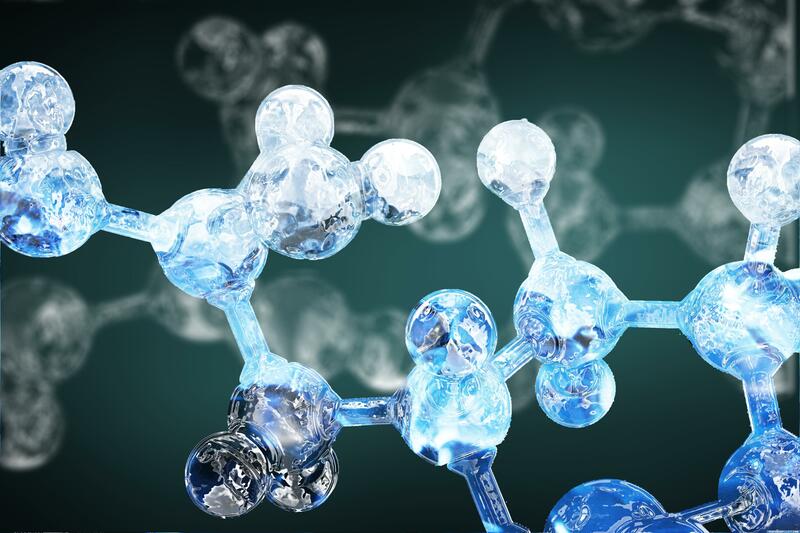 Will the digitization of chemistry be achieved? This lecture will seek to answer both questions in the affirmative. Lee Cronin is Regius Professor of Chemistry in the School of Chemistry at the University of Glasgow in Scotland, UK, where he was previously Gardiner Professor of Chemistry. Lee also is visiting Professor at Beijing University, and he is involved in more than 150 collaborations with research groups throughout the world. He also has been visiting Professor at the University Pierre and Marie Curie in France. Presently, Lee’s research is focused on five main interests: electron transfer; chemical synthesis; complex chemical systems; artificial (synthetic) life; and nanoscale molecular architectures. 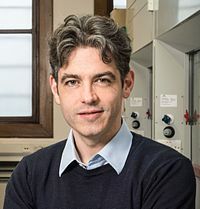 He and his co-workers are investigating these areas in uniquely interdisciplinary ways using robotics, artificial intelligence, and big data to develop new tools to explore and design chemical systems spanning the range from new chemical reactions to the synthesis of complex molecules, molecular devices, and synthetic life. Lee is an author or co-author on two books and more than 400 scientific papers. He is an inventor in 10 patents, and he is the founder of Deep Matter, a company focused on chemical robotics. 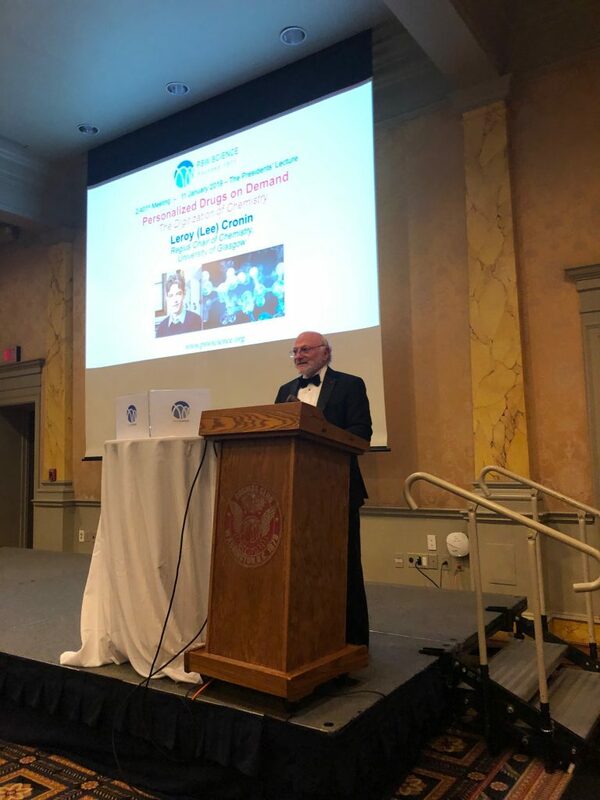 Lee speaks widely on his lab’s research, and has given over 400 invited lectures, including the Pearlman Lecture at the Weizmann Institute; the Solvay Lecture at the University of Belgium, and PSW’s own 81stJoseph Henry Lecture. 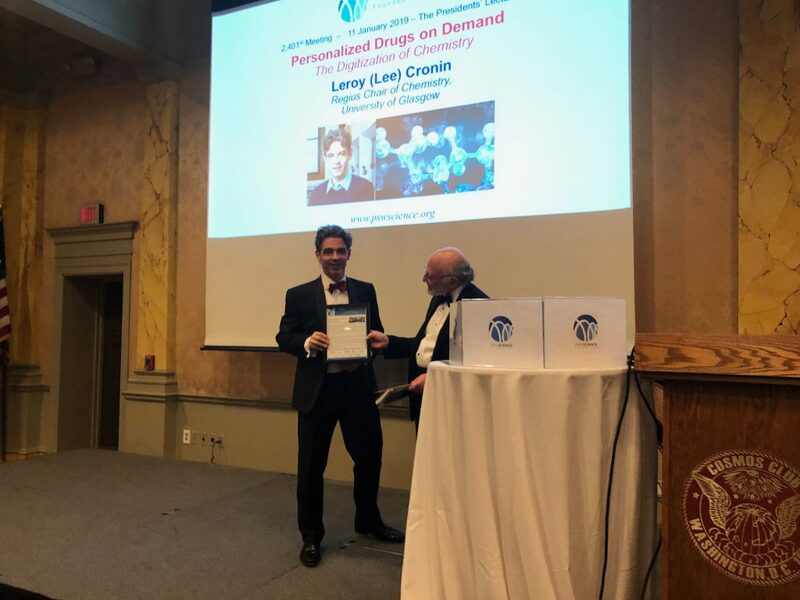 Among other honors and awards Lee has received the Royal Society of Chemistry’s Interdisciplinary Prize, Tilden Prize, Hutton Prize, Corday Morgan Medal and Prize and the Bob Hay Lectureship. He has also received a RISE Award, a UK Science Counsel Award, and the Royal Society’s Wolfson Award. Lee earned a BS and a PhD in Chemistry at the University of York. 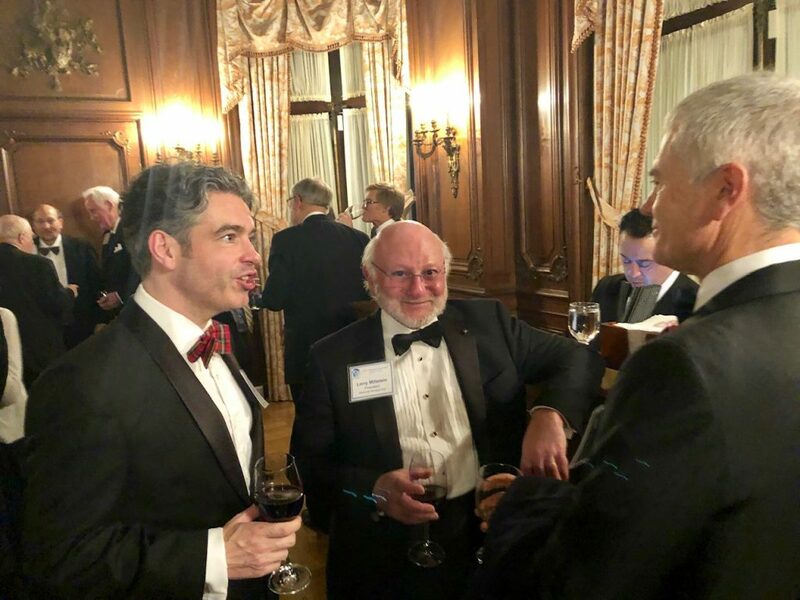 On January 11, 2019, President Larry Millstein called the 2,401st meeting of the Society to order at 8:01 p.m. in the John Wesley Powell Auditorium of the Cosmos Club in Washington, D.C. He announced the order of business, that the evening’s lecture would be livestreamed on the internet, and welcomed new members to the Society. The minutes of the previous meeting were then read and approved. Cronin predicts a revolution in chemistry that will dwarf the recent revolution in digital computing. In Cronin’s view, chemists have been constructing molecules in the same time-consuming, labor-intensive way for 200 years. As a result, discovery and production of new molecules remains slow. Chemistry hardware is expensive, not modular, not flexible, and not connected. Chemistry databases are not easy to access. And chemistry synthesis and discovery is time consuming, step and yield limited, and not always reproducible. Cronin says these problems can be overcome by inexpensive robotics and a concerted effort to universalize the language of chemistry. He began with the premise that chemistry is merely building blocks being added together in a sequence to produce molecules. By universalizing the language of sequencing instructions, the instructions for producing equipment, and making these instructions readily available, chemists could mechanize molecule production anywhere in the world. Indeed, in 2017, Cronin published in Nature the first chemical discovered using AI. Cronin’s team is now developing the digitized processes to make drugs on demand. The goal was to design a system that could be easily constructed, and could manufacture a drug by any lay person. As proof of concept, Cronin’s team coded a program using standard CAD software packages for 3D printing the basic chambers and connections to manufacture baclofen. They then wrote plain language instructions, like a cooking recipe, for a user to follow specific steps for inputting reagents and producing 70 mg of baclofen as the end product. Cronin says scientists can use his method to code and to produce any drug in existence, reducing capital expenditures to near zero. He proposes using the method to produce drugs with short shelf-lives, and drugs that companies have deemed too unprofitable to manufacture en masse. The U.S. military has also approached Cronin about use in the field. Moreover, Cronin says that by digitizing chemical production, Earth’s 200,000 bench chemists will be freed to focus their skills and abilities on advancing chemistry. Ultimately, Cronin believes chemistry will surpass biology to treat human medical needs. One guest asked about the error rate of Cronin’s process. Cronin said that excluding mechanical failure, the success rate was 100%. Another guest asked about the ethics of being able to produce any molecule, including opioids and weaponizable drugs. Cronin said his research was driven to help people and that it was up to governments and communities to decide whether and how to regulate such production. 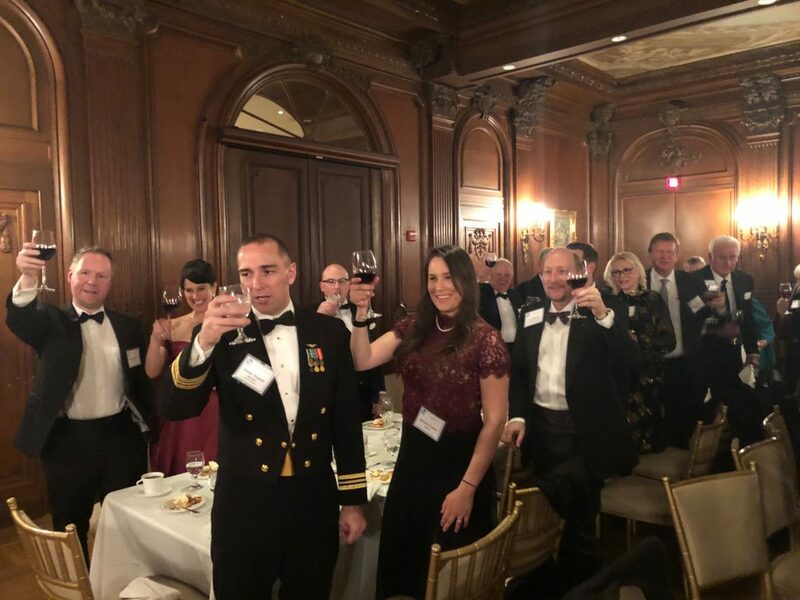 After the question and answer period, President Millstein thanked the speaker, made the usual housekeeping announcements, and invited guests to join the Society. At 10:13 p.m., President Millstein adjourned the 2,401st meeting of the Society to the social hour.